In order to complete our collection of reviews of airport lounges across the UK, we’ve asked for the help of our readers. 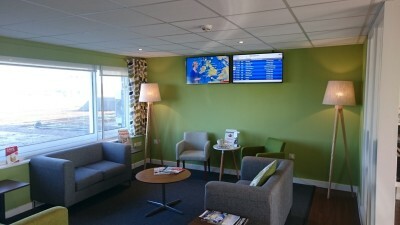 Reader Wes kindly sent us a review of the Executive Lounge at Exeter Airport. You can find all of our other UK airport lounge reviews here. We’re making good progress now! 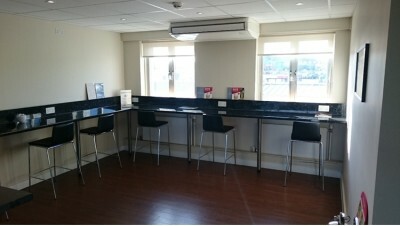 “The Executive Lounge is located upstairs in Exeter Airport. Access is available to Priority Pass members, however it is not a Lounge Club member. Interestingly, despite Exeter being the main hub for Flybe, Flybe passengers on an All-In ticket do not get lounge access as they do in most other airports. The exception is passengers for London City who are allowed in regardless of ticket type. To enter the lounge you have to be buzzed in by the receptionist who always looks surprised to see someone turn up. The lounge has to be one of the quietest I have ever been in. On the three occasions I have visited I’ve never seen another passenger in the lounge! Staff has always been friendly and I got a quick tour of the lounge on my first visit. There are no PA announcements in the lounge but the receptionist has always informed me when boarding began. I doubt this would be done if there were more passengers. There is also a TV screen showing flight status. The lounge is fairly basic as you would expect from such a small airport however it is perfectly pleasant and in good condition. 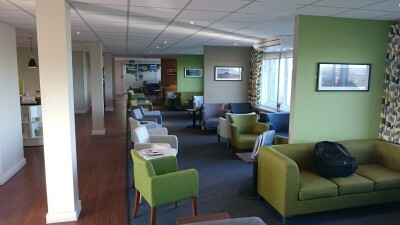 A social seating layout lines one side of the lounge looking out over the runway whilst the other side is taken up by toilets, business area and the buffet / bar area. Plug sockets are in short supply in the main area of the lounge with just a few hidden behind sofas, however the business area appeared to have plenty. No work stations or printing facilities were provided within this area. A selection of magazines and newspapers is available by the reception. 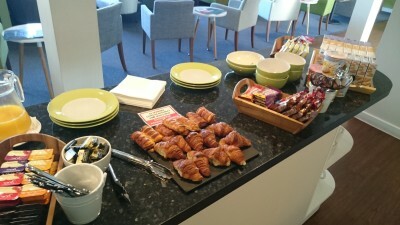 Food and drink in the lounge is good. There is no hot food is provided at any time, however the cold food is of high quality. 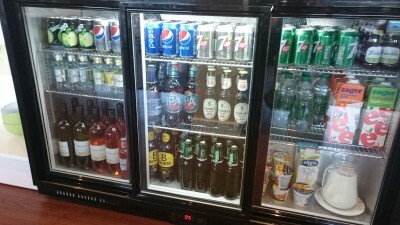 The selection of alcoholic drinks on offer is excellent for such a small lounge with four different beers / ales, cider, wine, alcopops and a selection of spirits. A sign on the wall kindly requests that customers do not take more than two alcoholic drinks although I doubt this is ever enforced. 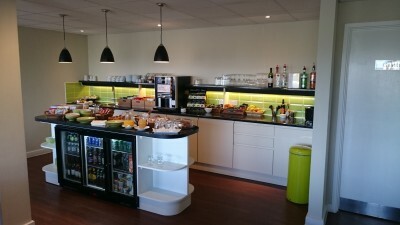 Overall I would say the Exeter Airport Executive Lounge is very good for such a small airport. My only complaint would be that the lounge appears to be a hangout for airport staff on their break who gather round reception talking and laughing loudly, probably due to the lounge being fairly empty most of the time. This got very distracting in an otherwise silent lounge. If the lounge was busy, I doubt I would notice this over the background noise. The lounge may not be of the same standard as some of the premium lounges in major airports but due to the large selection of alcoholic drinks and high quality cold food it is easy to get value for money. You can access this lounge using Priority Pass (free with American Express Platinum, or buy one directly) membership, or with Lounge Key via the HSBC Premier credit card. It is not part of Lounge Club (free with Amex Gold). Alternatively, you can book direct online for £17.50 via Lounge Pass. Am flying BRS-PMI soon with BA, and wondered if anyone knows which of the 3rd party lounges they will use for business/status travellers. You won’t get lounge access at Bristol. You’ll get the Sala Valldemosa in Palma. Domestic CE is relatively new so perhaps they give you a voucher for one of the Aspire lounges if you book that but there’s no oneworld lounge for status passengers. https://www.oneworld.com/ffp/lounge-access has nothing listed for Bristol. I have PP anyway. But was hoping to visit aspire plus. Rather than the standard on my CE flight next month. We shall see and I will report back if nobody has done before I go. Exeter is my local airport and I would agree with everything Wes says here. It’s a great little perk to visit this lounge using PP when we’re on some cheap Thomson charter out of Exeter. My wife once got stuck at Exeter airport for 9 hours when an Air Malta plane broke down, and this lounge kept her and the 2 children sane. I think she may have exceeded the 2 drink limit…. I think Carlisle united might exceed the 2 drink limit on their way home next Friday after securing their playoff final position.